I recently took a staycation and it was the best decision I made this summer. I didn’t realize how much I needed that time off to just do simple things that helped me refresh and feel stress-free. So busy, in fact, that sometimes we forget to take moments for ourselves. Pro tip: You need these moments. More than you know. Here are a few things you can start doing to feel that same sense of relief and maybe save yourself a little time, money, and headaches. This was one of my staycation discoveries. Instead of rushing on Sunday or breaking up family time, I opted to go on a Monday. It took me 20 minutes from the time I left my car until I checked out with a full cart. For most of you readers, this probably can’t be a reality since work gets in the way. But if you ever have the opportunity to go grocery shopping on a Monday, do it. You will save yourself time and the hassle of dealing with crowds of people on the busiest shopping day of the week! It may sound like something small, but you won’t understand how nice it is until you experience the difference. Whether you fly solo or have a family of five to feed, one thing is certain: meat is expensive. Instead of stressing yourself out about the 25 different ways you can cook pork, shop around. Check those grocery store flyers you find in your mailbox every week. See what stores you offer great deals on chicken, steak, ground beef, whatever it is your family enjoys, and then go buy a ton of it! Toss it into your freezer and don’t worry about it again for a few weeks. This is a money and stress saver. P.S. – this works on all items! Look for deals and stock up when you can. You’ll thank yourself later. I can’t tell you the anxiety I feel when my gas gauge gets below a quarter tank. I always try to fill up my tank when it hits that mark and my advice to you is: try it. Instead of testing your limits and stretching it out, get gas when you’re near a station and give yourself plenty of time. 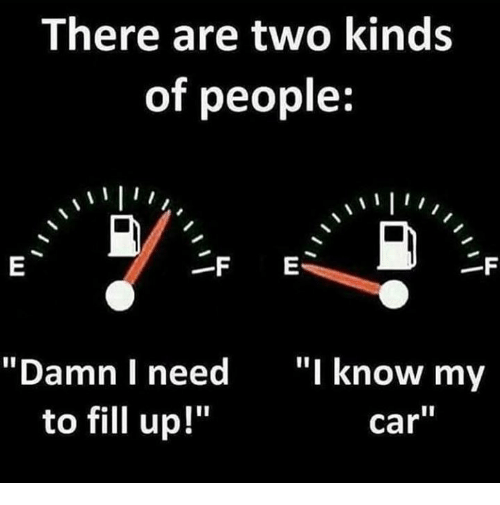 This may not be something that normally stresses you out, but I still think you’ll feel the same relief I do when you have a full tank before the gas light shines in your face. You may never go back to being that guy on the right. Or a “Spa Saturday” or “Jeans Tuesday” – basically, a day where you indulge yourself. Every Friday before work I buy myself an iced coffee. I do this for two reasons: it gives me something to look forward to, and knowing I have one day dedicated to it stops me from spending money on coffee multiple days a week. Pick a day that you want to do something special for yourself and stick to it. Sure, buy that coffee when you have a stressful day or stray from the plan now and again. But having something waiting for you at the end of every week, no matter how small, can really keep you going. Plus, not spending the money on these indulgences as frequently could make a pretty big impact on your wallet. Take an hour; take 5 minutes; take whatever it is you feel like you need, but take time for yourself to breathe and relax. After I had my son, I cried every night. Even though I was told it was normal, it felt abnormal for me. My doctor told me a big part of getting back into that normalcy was to give myself moments throughout the day. Guess what? Those little moments worked. Whatever it is you want or need to do for you, do it every day. Read, take a walk or a drive, go in another room and meditate – anything that will help you step away from reality for a few minutes and center yourself out. This is key to a healthy, happy you. Are there any other little, lesser-known life hacks you use to relax or save money? Tell us about them in the comments! Alex lives in the glorious northern state of New Hampshire and is a new-ish first-time mom to a one-year-old little boy called Aidan. She has the world’s most beautiful dimples, a very hot brother, and is an amazing friend/writer/gift giver. We love her and so should you. Wanna write for HTLYT? Send us an email or find us on social media! We buy each of our contributors a coffee and can get your words in front of an audience. Also, sometimes we get lazy and your posts give us days off. Praise. This is actually such incredible, practical advice! So many “relaxation” and “self-care” posts are so… unrealistic. Like, I would love to take a week off to lounge around or travel, but I’m in school and I have bills to pay. But buying food in bulk when it’s on sale? Taking an hour to just do what I want? Those things make life so much easier without breaking the bank or shirking my responsibilities.